You are allowed to switch to a branch, provided that branch doesn’t already have different changes to the same file. You’ll see the happy case, then the #sadtrombone case. 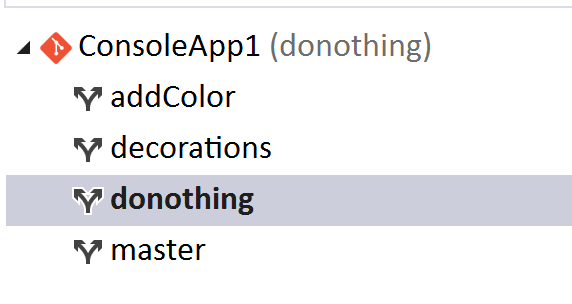 Suppose you have a Console Application and you need to add a new file called IDoNothing.cs – yep, how I roll. Note that I haven’t committed anything else. These files are only saved. Team Explorer will still allow you to switch branches. 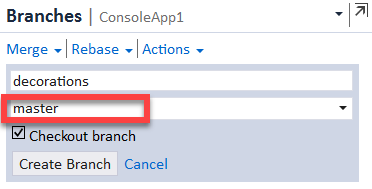 Go to Team Explorer – Branches, and switch to the desired branch. Then you can commit your IDoNothing.cs file into the donothing branch. 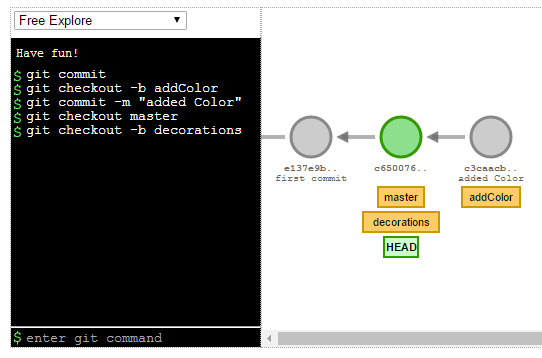 From a previous tip, we’ve made changes to the output in our decorations branch. So let’s switch back to master and make some changes to Program.cs, e.g. adding a new method call. We’ve saved the changes, but haven’t committed them. Now when we try to switch to decorations branch we get an error message. It seems that I have to write these tips in triplicate: 1. command line, 2. 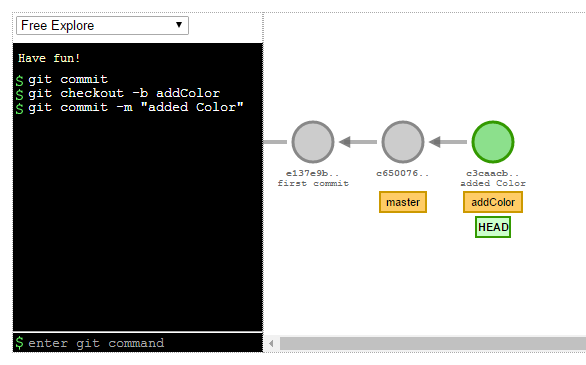 Visual Studio, 3. git visualization tool. But that’s been the only way to prove to myself I’m grasping the concepts. A college French professor once gave me the advice to never use contractions in class unless I was prepared to never ask him to slow down. I had just learned the equivalent of “I do not know” vs “I don’t know” (something like that). Okay that’s pretty straight forward, but what’s happening conceptually? 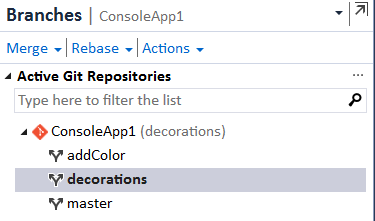 We are on master when we created a branch called addColor while on master and then switched to addColor. The take home message is that addColor has everything that master has because we created the branch addColor while on Master. Before we jump into the IDE, let’s take a sneak peek at that shortcut. Note: in case anyone is following along at home, I first switch back to master to delete the addColor and then recreate using the shortcut. This shortcut says to checkout to addColor and if it doesn’t exist, create it. 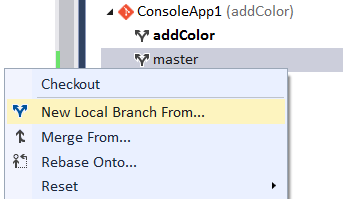 If you have the Checkout branch checkbox, you’re telling VS to create the branch and do the checkout so you’re now on the addColor branch instead of master. If you uncheck it, it is the equivalent of creating the branch on the command line, but staying on master. To confirm you’ve created and switched to the addColor branch, you’ll see that addColor is now in bold. 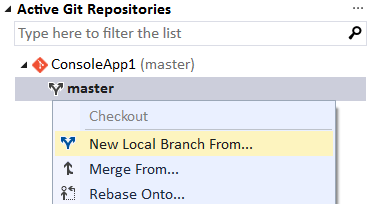 And the branch is also shown in the Visual Studio status bar. Yesterday’s tip talked about how to use `git revert` from the command line. 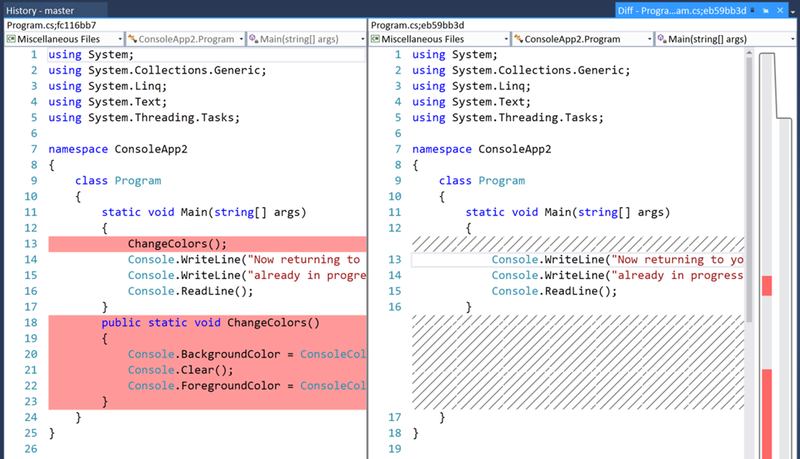 Today’s tip describes the functional equivalent in Visual Studio. TBH I clicked the wrong command in VS initially when I started writing this post. I clicked “reset ” then the “–hard” option, which should have been a hint. Revert doesn’t have the soft, mixed, or hard options. 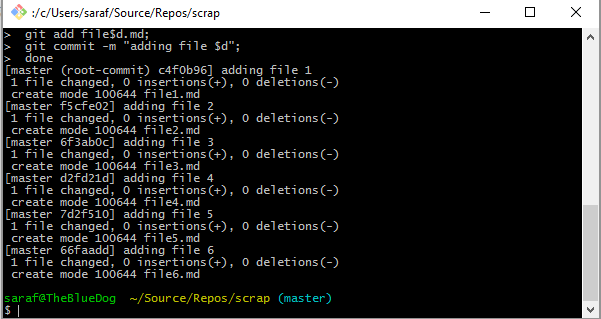 But, I was able to fix my git history (by going to the command line) to write this tip without deleting my .git folder and starting over, which is a first for me. So perhaps all this work writing out these tips is working! 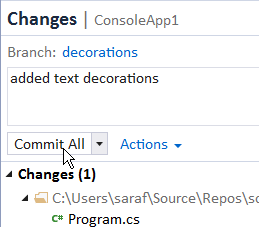 You want to remove this commit altogether. If you’ve been committing in small, atomic chunks of code, you should be able to revert this background color change. But don’t take my word for it. I wouldn’t know because I’m still trying to train myself to do small commits. If you refresh History, you’ll see the new commit. You can double-click to open that commit’s details. If you edit the commit message, the Amend Message option will become available. 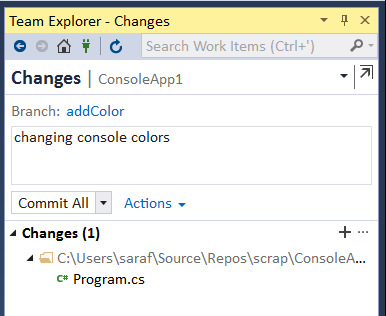 Double-clicking on the Program.cs file listed under Changes for the Commit Details pane shows what’s been removed or “reverted” from the codebase. And to verify we are back to our familiar console application background, let’s run the project. What do we mean by “undo a previous commit?” Let’s say we had 3 commits A, B, and C. And we realize ‘B’ was a mistake. Perhaps we changed a color to red, and it should go back to white. But we don’t want to pretend that ‘B’ never happened. 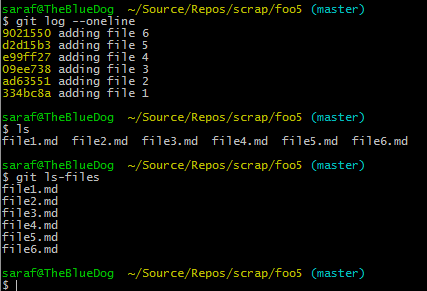 That would mean modifying Git history, and Git really hates changing history if you have the repo shared with others. 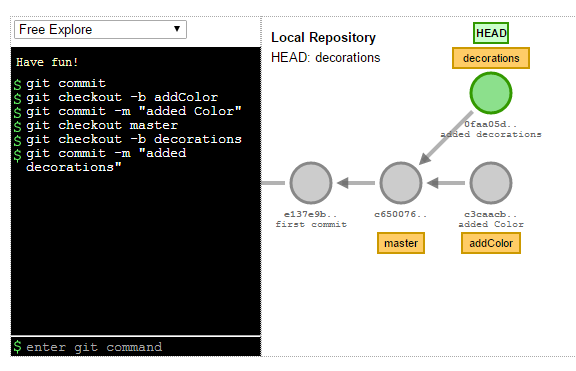 As you see in the above graph, using this git visualization tool, a new commit is made with the changes introduced from ‘A’ removed. The take home message is that a new commit is made, instead of “commit A” vanishing. Now to the command line to see this in action! We want to “undo” the changes introduced in B. If you are following along at home, let’s pause for a second and make sure your core.editor is configured to use your preferred text editor. The read between the lines: you’ll want to know how to exit whatever editor comes up. Right now I’m using notepad to give me a fighting chance instead of the vi editor, aka the destoryer of CS careers. YMMV, so check out this GitHub help article on setting up an preferred text editor. Hint: it’s `git config –global core.editor notepad` if you want to use notepad across all your repos. Okay with that taken care of, let’s do the revert. We want to “undo” the B.txt commit, so let’s party w `git revert <commit id for B>` and suddenly a wild notepad appears! 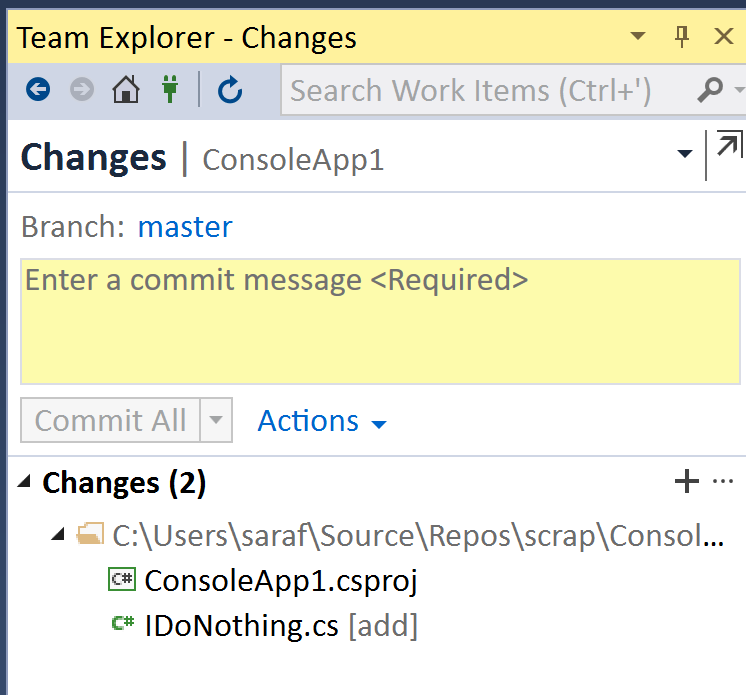 Since I’m cool with the default commit message “Revert ‘B’ for this demo (remember, git revert creates a new commit so it has to get a commit message from you), simply close notepad (File – Exit or ‘x’). 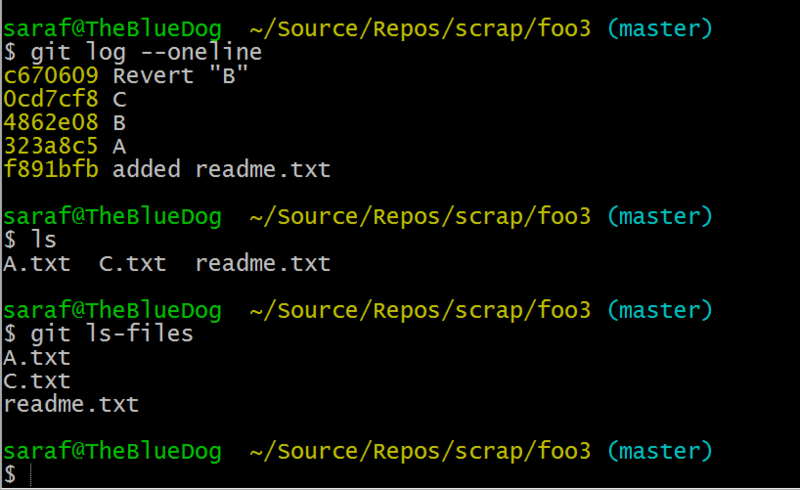 Now if you do your git log –oneline, you’ll notice the new commit. If you do a `ls` or `dir` and the git-equivalent to see what files git is tracking `git ls-files`, you’ll see that B.txt is no where to be found. Once again to recap what we did. We could have simply deleted the file B.txt and committed those changes. 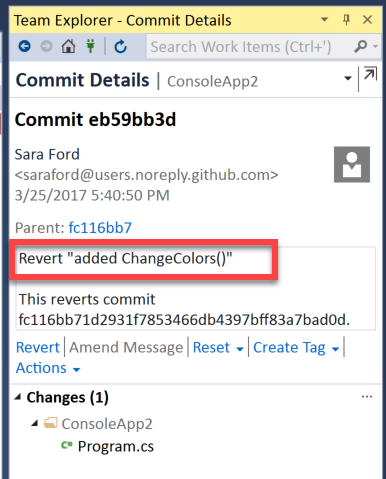 But for a more complex scenario where you need to remove a feature that consists of more than a single file or line change, you should consider using `git revert`.